Are you part of an innovative science-based healthcare company? Are you interested in translating innovative research into practice? 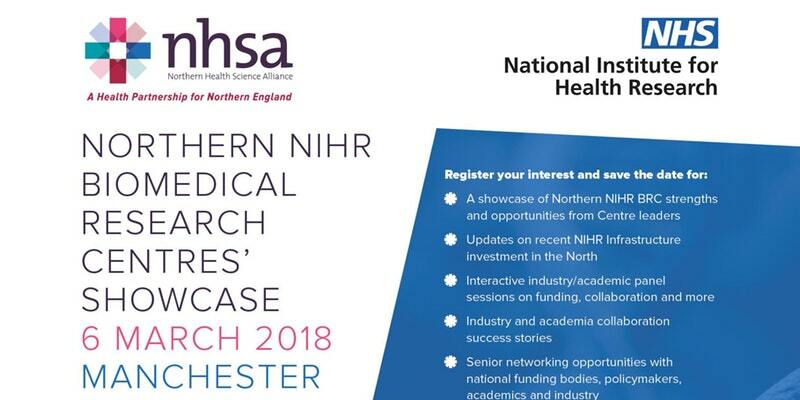 After the successful awarding of Biomedical Research Council (BRC) funding to four centres across the North a showcase event for industry is being held by the Northern Health Science Alliance and National Institute for Health Research on March 6. Join this unique opportunity to speak to the Northern NIHR Biomedical Research Centres and leading universities, on how they can support translational research through: funding partnerships, clinical research projects, access to clinical research, facilities and expertise and evaluation and testing of products. The Northern BRCs are among 20 NIHR BRCs providing nationally leading expertise in clinical trials, health economics, informatics, data science, imaging and biomarker discovery platforms.